Written by Clare Overton Lewis on 09 July 2014 . The senior medical and scientific staff of the Microbiology and Virology laboratories provide expert advice on clinical, scientific and technical issues to users of the service. The clinical service is consultant-led and available on a 24-hour basis to hospital clinicians and GPs. When to call us: For simple queries the Trust antimicrobial guidelines should be able to guide you. All positive results from sterile sites (including blood cultures) are phoned out by the laboratory when positive. There is a laboratory bench round between 11.00-11.30am every day and there is an ITU ward round daily between 2.00-3.00pm, when Microbiology doctors won’t be readily available. For urgent enquiries, ask your consultant to speak to the duty Microbiology consultant via switchboard. When you call: Please tell us who you are: name, team and bleep number. Please tell us who the patient is: name, PID, location. (Note all consultations and advice given is documented in our laboratory system). Please have the patient’s notes and observation chart with you. Out of hours- Always discuss the case with your seniors first (registrar/consultant), go through switch and ask for the microbiologist on-call at your hospital. Please be aware they may not have access to results so carefully review iCare for alerts etc. Who to call: During working hours, please contact the Virology registrar on Bleep #2821. A consultant Virologist is available via switchboard on a 24 hour basis. Please be aware that out-of-hours that the Virologist may not have access to results, so carefully review iCare for alerts etc. Specialist Advice: The consultant virologists provide specialist advice for patients throughout the West Midlands, including clinical interpretation of laboratory results and risk assessments for exposure to blood-borne viruses. The laboratory also serves as a national reference centre for HIV resistance testing, as well as providing resistance testing for Hepatitis B and CMV. The laboratory is one of two designated laboratories for the testing of Hepatitis B in healthcare workers undergoing exposure-prone procedures, as per DOH guidelines. Outbreak support:Support to the PHE Health Protection Teams, CsCDC and Local Authority Environmental Health Departments is provided at two levels. Consultant staff provide expert clinical advice on specific infections and guidance on appropriate laboratory investigations. They also act as the local and regional microbiology co-ordinator. The laboratory provides support for testing of specimens collected in the course of outbreak investigations. Staff are co-opted onto Outbreak Control Teams and attend outbreak review meetings. Senior staff are also expected to give advice and support to the work of other Agencies. Normal immunoglobulin is also available for use within published guidelines. In cases of possible exposure to rabies, both specific immune globulin and vaccine may be supplied for post-exposure prophylaxis. For these services, please contact the duty clinical virologist via Heart of England NHS Foundation Trust switchboard (0121 424 2000). Created on 09 July 2014 . Last updated on 27 January 2019 . Written by Clare Overton Lewis on 08 May 2014 . Samples For all antibiotic assays, 5-10mls blood into red-topped tube (no anticoagulant) DO NOT sample from the line through which the antibiotic has been given. GENTAMICIN / TOBRAMYCIN (once – daily regime) Post-dose only taken between 6 and 14 hours after dose. N.B. Times of dosing and sampling must be given on request form. After taking pre-dose levels, give the prescribed dose as normal – DO NOT wait for the results of the assay. “Random” levels should seldom be needed and should only be taken by prior arrangement with the Duty Microbiologist. For patients with stable renal function, whose results are within the expected range, assays do not need to be performed more than twice a week. Where renal function is unstable or poor, assays should be discussed with the Duty Microbiologist. Created on 08 May 2014 . Last updated on 08 May 2014 . Written by Clare Overton Lewis on 07 May 2014 . Intravenous vancomycin treatment requires regular monitoring of pre-dose (trough) levels. The trough level should be 5-15 mg/l. Created on 07 May 2014 . Last updated on 07 May 2014 . Where drugs of known, dose-related toxicity are used. b) In order to monitor levels when the drug used has a narrow therapeutic range. For aminoglycosides (gentamicin and tobramycin), efficiency is related to peak concentrations achieved, while for glycopeptides such as vancomycin, efficiency is related to the time over which therapeutic levels are maintained. Information on performing antimicrobial assays is given below, but Medical Microbiologists are available, at all times, to discuss assays and the interpretation of results. Antibiotic dosage in renal failure can be obtained from the appropriate Intranet site. Antibiotic assays are performed twice a day and are processed in batches, a morning run and an afternoon run. Any bloods sent for antibiotic assays after 2pm will be processed the next day. Assays are NOT generally available out of hours, but blood may be taken and stored on the ward to be submitted the following morning. All of these antibiotics are stable at room temperature or in the refrigerator. This is a draft protocol being piloted in the Trust & will be subject to review. Do not take urine samples just because urine is cloudy, smelly or offensive. Send urine samples if the patient has signs or symptoms of UTI (e.g. pyrexia). Obtain specimen before commencement of antibiotics, as results are difficult to interpret once antibiotics have been commenced. Do not take routine specimens at catheter changes, do not send catheter tips. Use boric acid red top urine sample tubes and fill to line. Send specimen on patients with diarrhoea where an infective cause is suspected. Do not send a specimen if one has been sent in the last seven days as this will not be processed. Do not send repeat specimens to see if negative as decision not to isolate is made on the cessation of diarrhoea not microbiology results. Only take specimens from postoperative wounds if there is a purulent discharge i.e. the wound is discharging pus. Only take a swab if there is inflammation in the surrounding area and a purulent discharge. N.B An offensive smell alone is NOT AN indication to take a swab. 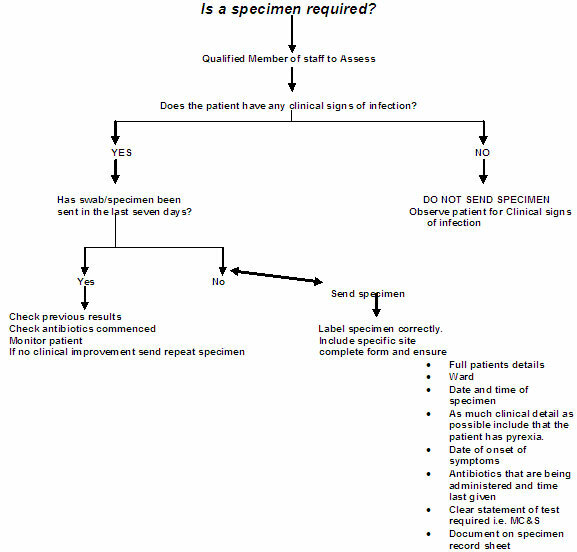 Sputum specimens should only be sent on patients with a diagnosis of pneumonia and only if they are productive and they have not yet commenced on antibiotics. If already on antibiotics, this MUST be recorded on the request form. Samples from COPD patients need to be specifically requested by medics. TB specimens should be requested by medics and 3 early morning specimens are required. If sample is urgent please telephone the laboratory so that it is expected and can be processed as quickly as possible. N.B Tips, Catheters and drains are not useful specimens as they are often contaminated or colonised and do not provide useful information. Last updated on 01 October 2014 .